The stars that make up the constellation Libra were once considered part of Scorpius. To the earliest stargazers, there was a mysterious line in the sky along which the sun, moon and planets seemed to move: the ecliptic. It has been called by other names such as "the Road of the Sun." The constellations along the ecliptic are called "the Zodiac," a wide belt of stars running in a complete circle around the sky that was created by the ancients in their effort to find some means of following the movements of the sun, moon and planets. For example, the ringed wonder of the solar system, the planet Saturn is currently located amidst the stars of Libra, the Scales. And of all of the zodiacal constellations, Libra is the only star pattern that does not represent a person or an animal; the only inanimate object among the signs of the Zodiac. When the Romans invented the Libra constellation, approximately 3,500 years ago, it contained the Autumnal Equinox — the point in the sky where the sun crossed the equator on its way from the Northern Hemisphere to the south. That's the time of the year when days and nights were equal. It was likely because of Libra's location at this particular spot on the night sky that scales were chosen for the symbol for this constellation. They were thought to represent the scales in which night and day were weighed which on the date of the equinox were perfectly balanced. The Romans made the two claws of the constellation Scorpius (the Scorpion) into the arms of Libra. Originally, Libra was known as "the Claws" of Scorpius the Scorpion to the poet Aratus and others of classical times. In fact, two of Libra's stars still bear the Arabic names, Zubeneschamali and Zubenelgenubi, meaning respectively, "Northern Claw" and "Southern Claw." Zubeneschamali also has a very faint greenish tinge: the only green naked-eye star. 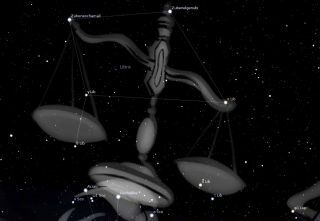 Ultimately the two claws of Scorpius were fashioned into the arms of Libra. Many years ago, one of the long-time lecturers at New York's Hayden Planetarium reprimanded me after I had given a night sky show and pointed out Libra to my audience. "Listen," he said, "the correct pronunciation is "Lī-bra," not "Lee-bra." Remember, you go to a "Lī-brary," not a "Lee-brary!" I initially did not believe him, especially since I knew that the word library had its origins from the Latin word "libraria" (meaning book), while Libra was Latin for "balance" — hence two totally different things. But when I returned home and did some checking, I found that the World Book Encyclopedia (Field Enterprises Educational Corporation) indeed suggested the pronunciation LY-bruh, while The American Heritage Dictionary of the English Language (Houghton Mifflin Company) deems both Lī and Lē as acceptable. Now, whenever I look at Libra, I always think of my former Hayden colleague and as a remembrance to him, stress the Lī. And have you ever wondered why the abbreviation for the word pound is "lb"? It is in deference to the first and third letters of Libra, the Scales. That's a pretty weighty answer to an often-asked question if you ask me. Joe Rao serves as an instructor and guest lecturer at New York's Hayden Planetarium. He writes about astronomy for Natural History magazine, the Farmer's Almanac and other publications, and he is also an on-camera meteorologist for News 12 Westchester, N.Y. Follow us @Spacedotcom. We're also on Facebook and Google+. Original article on Space.com.